I had not yet posted my March Mission: Inspiration and hadn’t even started the April Inspiration. Hydrangea Blue is one of my all-time favorite colors from Lindy’s stamp gang and is perfect for bottom-of-the-ocean water. Blue Hawaiian Blue gets a lot of use too, especially in mixed media for baby boys. I created a mini-album last spring for my niece and had used the Mermaid stamp from Stampendous for one of the pages. I also had these Lavinia Stamps bubbles that I was looking to work into something. The Under the Sea theme provided an excellent opportunity to use them both, as the mermaid stamp is beautiful but has somewhat limited range. I also needed a quote for the page. I went back to the mini-album for inspiration. My niece can be a very deep thinker sometimes and I found the quote on the internet that perfectly summed her up. Theme and design established, it was time to gather supplies. 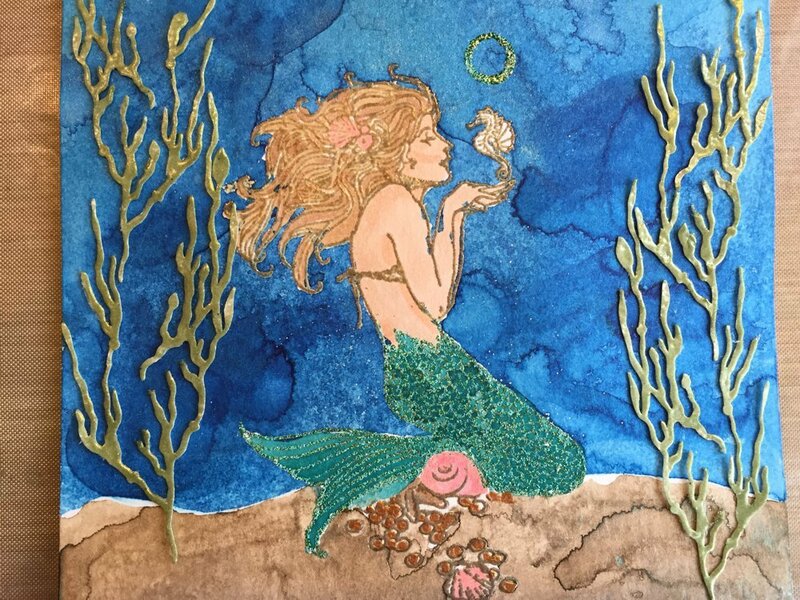 With coins and other sea life surrounding her, the mermaid is clearly resting on sand, so I looked through my collection of Moon Shadow Mists and found Treasure Island Aqua. This spray is sepia colored with a beautiful Caribbean aqua shimmer, just right for a sea theme. I have struggled with using the Moon Shadow Mists but this time, it was perfect to build a sandy ocean bottom. 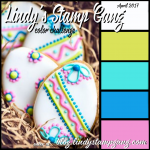 The April challenge at Lindy’s also included embossing powders. 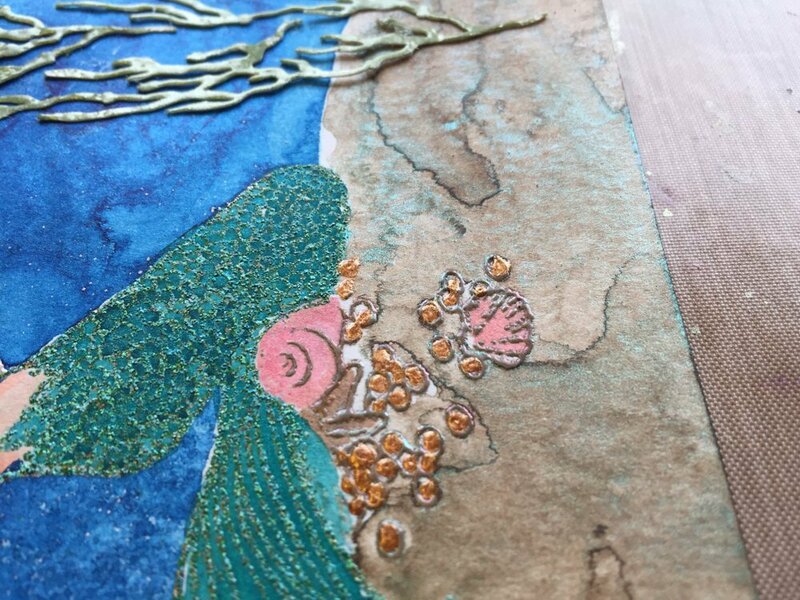 I used Oakleaf Olive to color the seaweed, giving the scene a three-dimensional aspect. 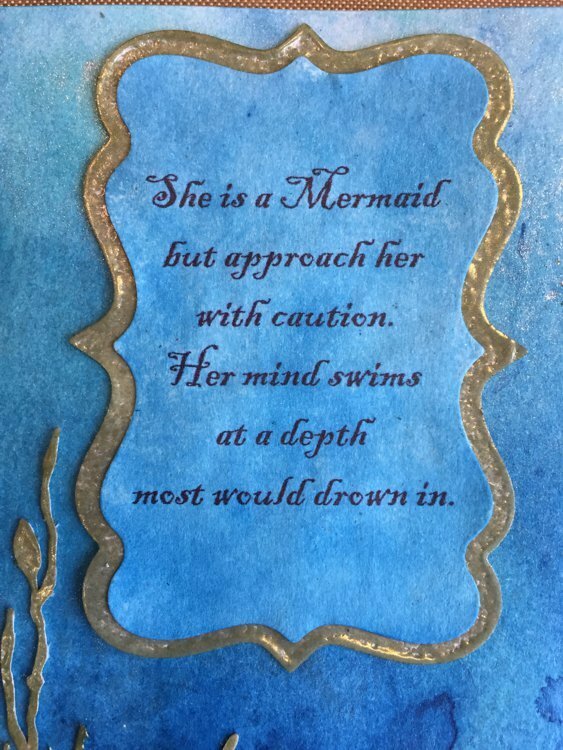 I found the seaweed in the Silhouette Design Store and cut it on my Silhouette Cameo, but there are similar greens found in one of the Tim Holtz Sizzix die sets. 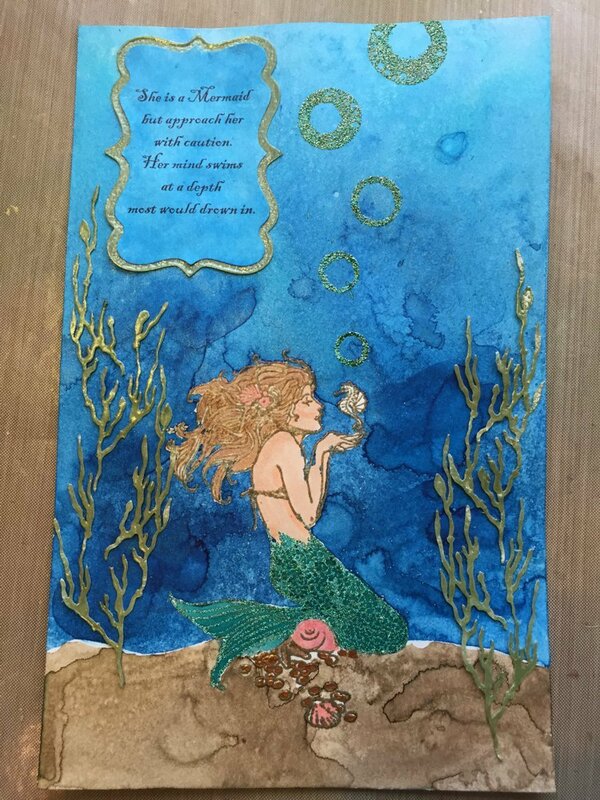 The mermaid was stamped using Stampin’ Ups Sahara Sand. I don’t have a large collection of ink, but this one came closest to skin tones without overpowering the Golden Pumpkin Blush embossing powder (retired). For her legs/fins, I used Tibetan Poppy Teal Starburst spray and a paint brush for coloring. 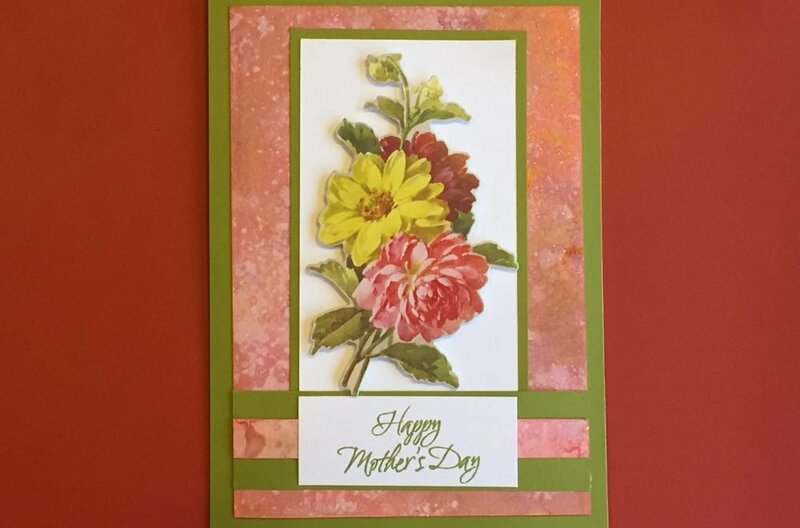 A little bling was added with Ranger Verdigris embossing powder. This powder is a green interspersed with gold flecks. It takes a lot of heat to melt, but the results are beautiful and perfect for a mermaid scene. The rest of the mermaid was colored with Copic markers in a variety of light and mid-tone tans. Here is my completed art journal page. I love how the pools of blue spray look like the ocean depths. I was also happy with the quote. It was printed on my Epson inkjet printer, with DuraBrite inks. This ink does not smear when you get it wet. And it took the blue spray perfectly. 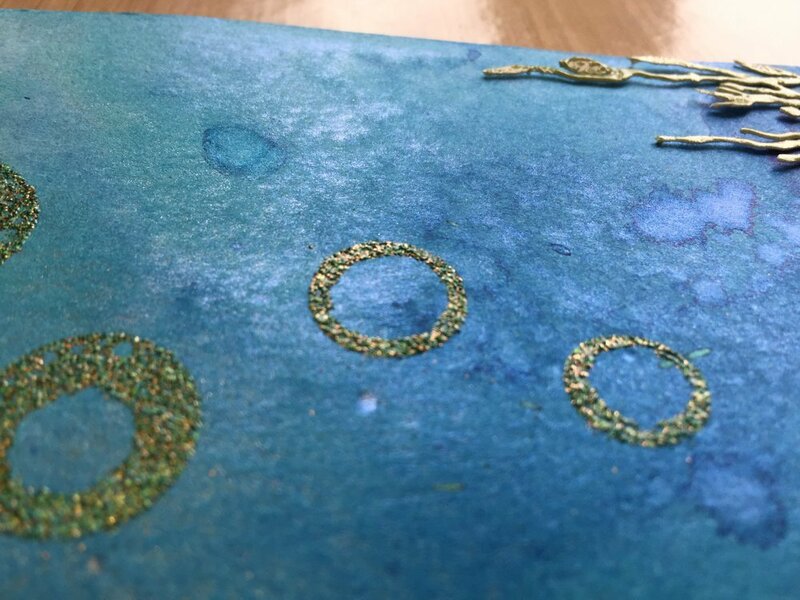 This art journal page was inspired by a mid-month Mission:Inspiration within the MI Facebook group. 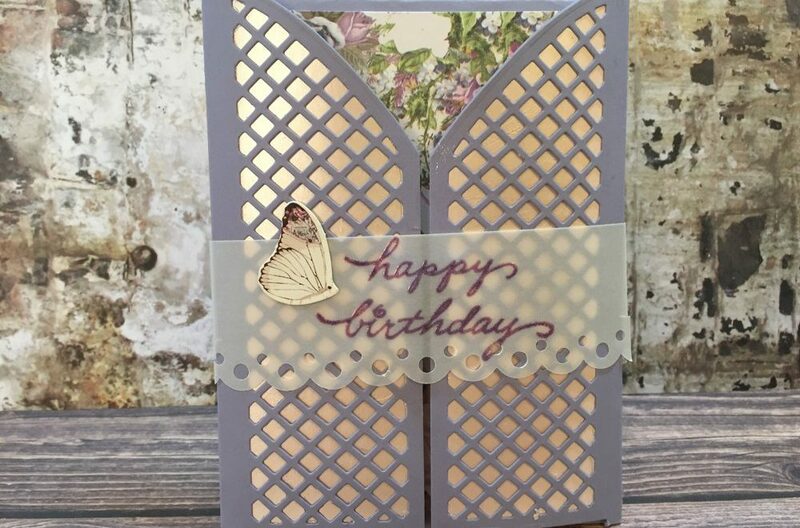 It’s also part of the Lindy’s Stamp Gang April Challenge, click on the picture for more details. None of the links or product references in this post are affiliate links, they are for your convenience in finding the products that I used. A perfect interpretation of our challenge with such beautiful detail. Thanks for playing at Lindy’s challege! Great take on our challenge! Thank you for joining Lindy’s Color Challenge! Such a beautiful project! Thank you for joining Lindy’s color challenge! Thank you! I had a lot of fun with this one! 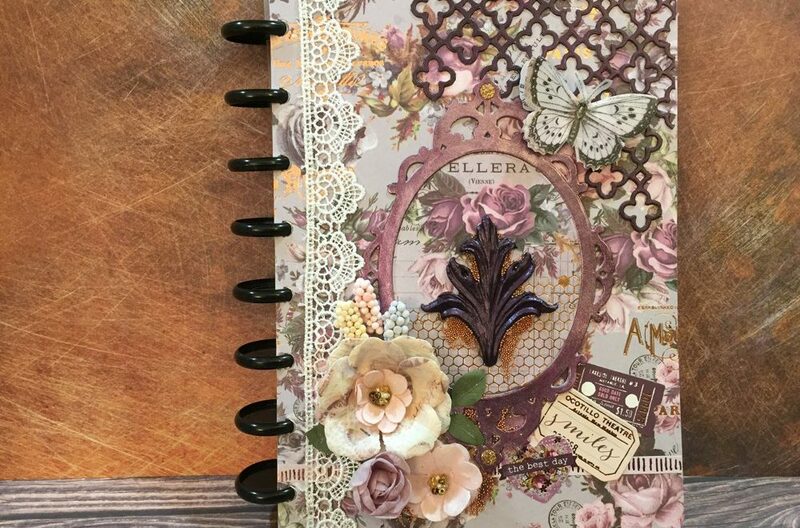 This is a gorgeous journal page! thank you for joining at Lindy’s challenge!